NOW: Again, Jean Sherrard used whatever was available – a ladder and an extension pole - to approach the prospect taken by the Seattle Times photographer in 1928. The theatre’s name was changed to Paramount in 1930. Some of the changes here – by no means all – in the 27 years I have now scribbled this weekly feature have made me nostalgic for lost places and – well – pleasures. But much is also the better for it – much better. Ida Coles restoration of the Paramount Theatre is a fine example. Another improvement is the community of scholars that has grown up in the interval to often write about heritage. The creative – but not closed – circle at the by now familiar web encyclopedia called historylink is the most obvious example. 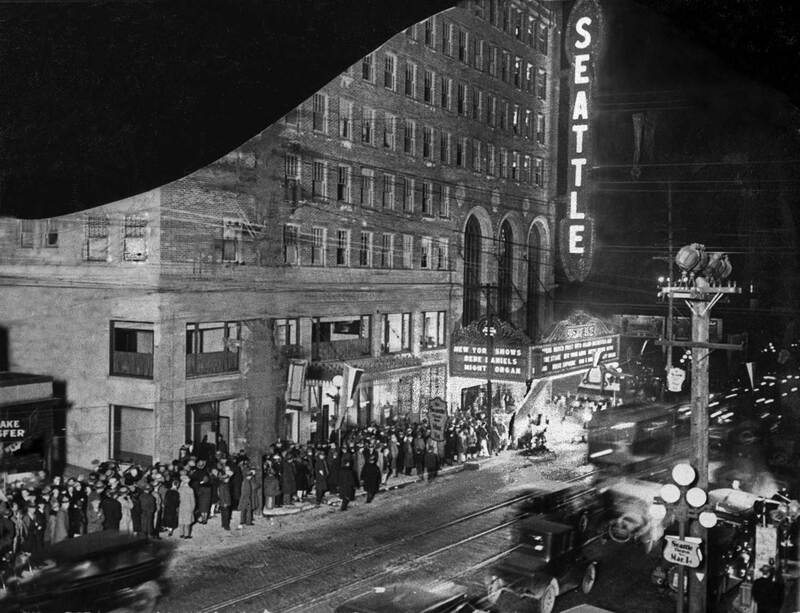 But there are many others, and I’ll use the apparent mutilation of this photograph of the Seattle Theatre on its opening night in 1928 as a way to introduce one of them: David Jeffers. Jeffers is an impassioned and by now very knowledgeable student of local theatre history. His interest in the era of silent films is such that he helps in the exhibition of them, sometimes here at what has long since been renamed the Paramount Theatre. Ron Phillips, Seattle Symphony’s now deceased legend of the clarinet, first shared with me this fragment of a photograph. 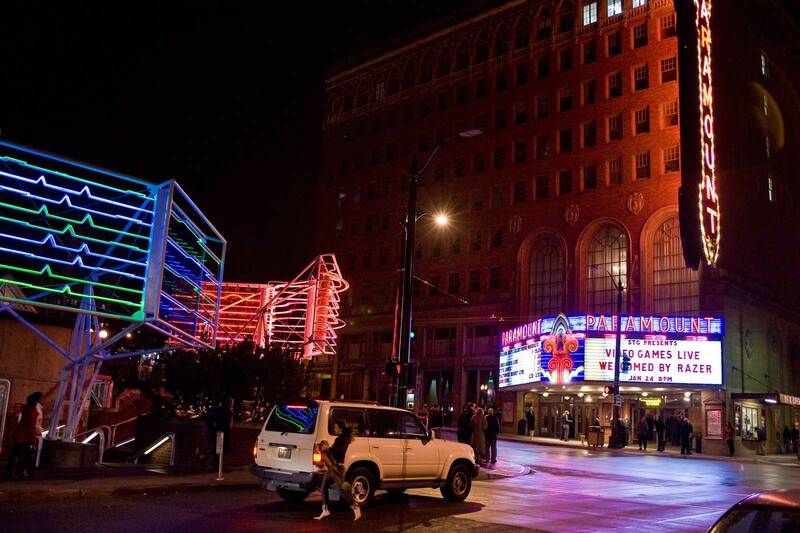 He had both played and lived at the Paramount. (David Jeffers also once lived there.) With a lamentation about its torn condition attached, I sent a copy of the photograph to Jeffers. Jeffers soon answered that the “tear” was really a “designer cut.” The photo was used in The Seattle Times’ review of the joyful grand opening. There the “black hole,” upper-left, is artfully filled with a news photograph of uncomfortable mayoral contestants Mayor Bertha Landes and her challenger Frank B. Edwards purchasing the first tickets to the grand opening. Almost certainly they did not sit together. 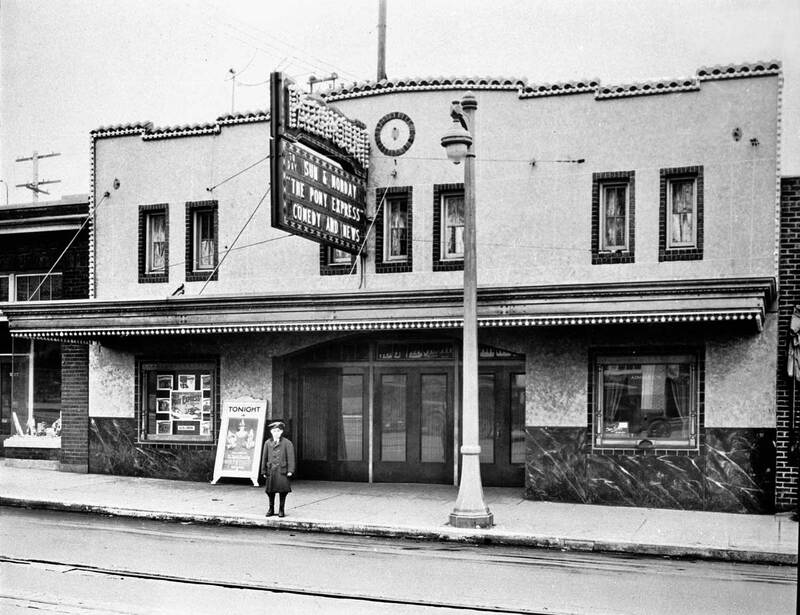 For a delightful description of the Seattle/Paramount Theatre history – including details on this opening night – you might start by reading theatre historian Eric L. Flom’s historylink essay. Postscript: Edwards beat Landes out of a second term. Three years later he was impeached. Another view from around the corner. 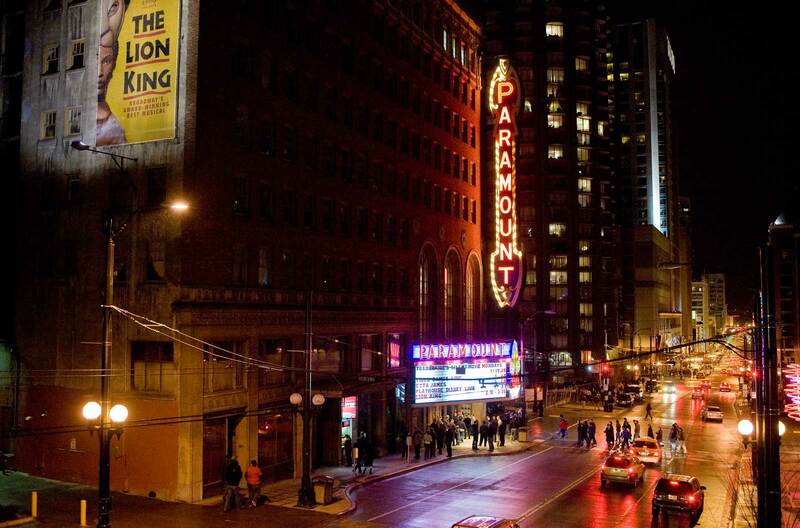 Now & Then Tidbit: When the Paramount was the Seattle Theatre, Wallingford’s Guild 45th was the Paramount. For the story behind that name change, please visit this Seattle Now & Then column from January 31, 1993.
along with a complete list of the original silent films screened at The Seattle.